If you’ve been looking for a University course in aquaponics but could not find one, your search is over! Nelson and Pade, Inc., is happy to announce that the University of Wisconsin – Stevens Point (UWSP), is now offering a 3-credit, full semester course in Aquaponics – Introduction to Aquaponics. This course is a partnership with Nelson & Pade, Inc. and the University of Wisconsin-Stevens Point Continuing Education, Department of Biology, and the Northern Aquaculture Demonstration Facility. And, the most exciting part is that the course is open to anyone interested. You do not need to be a student at UWSP. The course has been jointly developed by Dr. Chris Hartleb, Professor of Biology, UWSP, Sarah Kaatz, Education Director, Nelson and Pade, Inc. and Rebecca L. Nelson and john Pade, Nelson and Pade, Inc. This private/public partnership and the resulting UWSP aquaponics course is a whole new level in the development of the aquaponics industry and in providing comprehensive training in aquaponics at the University level. The lectures run from March 1 – May 11, 2012 and take place online, each with a self-study lecture followed by a live chat with one of the three instructors. 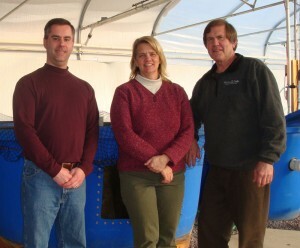 The hands-on lab sessions are held at our demonstration greenhouse in Montello, WI, May 21-23, 2012. We will have fun teaching the students and sharing our passion for aquaponics. I am extremely excited about this partnership and the potential it represents. As the aquaponics industry grows, one of the big issues we face is a lack of trained and educated individuals to fill jobs as aquaponic greenhouse managers and workers. The launch of this course, which I believe is the first of its kind, has the potential to grow into an aquaponics minor and eventually an aquaponics major at UWSP. I am grateful to Dr. Chris Hartleb, Professor of Biology, Dr. Chris Yahnke, UWSP Chair of the Biology Department, Dr. Chris Cirmo, Dean of the College of Letters and Science and Dr. Greg Summers, UWSP Provost for their interest, support and eagerness to embrace this partnership and to help bring aquaponics to the forefront of University education. And, I so appreciate our Education Director, Sarah Kaatz’s efforts in collaborating with UWSP and helping to move this concept forward to reality.